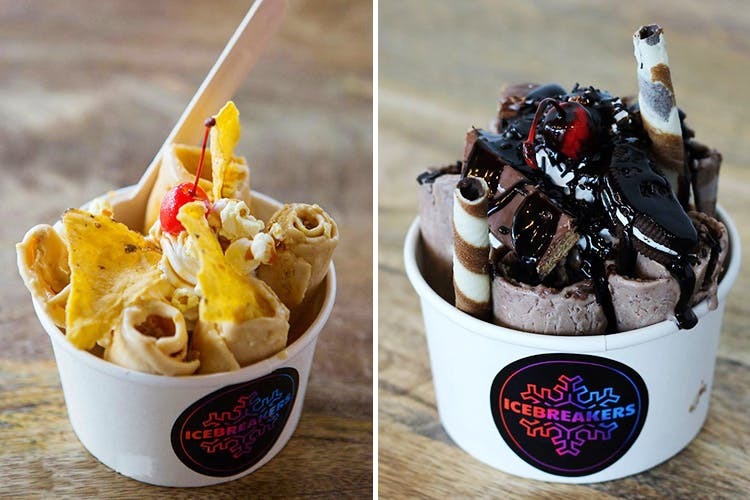 Icebreakers is a small ice cream parlour in Koramangala that does live ice cream rolls of every imaginable flavour. A tiny little ice cream parlour that will spoil you for choice when it comes to flavours, Icebreakers really mixes things up. So don’t expect the usual vanilla, and chocolate. Let your imagination run wild. The joint is known for their Chilli Guava Ice Cream rolls and Oreo Serious ice cream rolls. The guava ice cream rolls come with freshly cut guava pieces as toppings and are sprinkled with chilli powder – just like the street snack, but as an ice cream! The strawberry sticks on the side add extra fruitiness to the ice cream. The place comes with minimal yet colourful decor owing to the colourful chairs and tables. It’s well-lit and you can watch the ice cream counter even when you’re sitting. Bored of the usual desserts and looking for something with a cool kick? This is ideal for you then! And more so because it’s just INR 120 per ice cream roll. I tried the Guava Chilli and the Netflix which is butterscotch ice cream with nachos, popcorn, and caramel and butterscotch drizzle. The Netflix was the best of the lot though they could have been a bit more generous with the toppings. But then again, I was really craving nachos, so that might be why I found it too little. What I love most about this place is that they also let you make your own ice cream rolls right from the base to toppings! So much experimentation to be done! Oh, and they also do shakes.